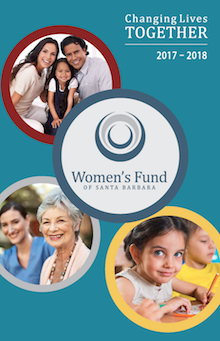 The Women's Fund of Santa Barbara is a volunteer-led collective donor group that enables women to combine our charitable dollars, providing significant grants focused on the critical needs of women, children and families in south Santa Barbara County. The Women's Fund is committed to building a large community of educated, strategic givers who are inspired to make lasting change in our community through the impact of collective giving. The Women's Fund remains committed to the simplicity of the original model: members pool their charitable donations, research critical community needs and then vote on which agencies will receive funds collected during the year. The Women’s Fund of Santa Barbara is a volunteer-led organization operating as a Field of Interest Fund of the Santa Barbara Foundation. This structure allows us to determine the best way to respond to our community’s most pressing needs in areas that interest us without taking on the expense of creating and managing a traditional nonprofit. A financial “umbrella” for administrative and financial support–for which we pay a 3% fee. Regular contributions to both our grants pool and our endowment. Expertise and financial support for our website and member database. Oversight in managing our Women's Fund Endowment. In 2002, after reading an article in the Los Angeles Times about the Everychild Foundation, Carol Palladini and Meredith Scott invited its founder Jacqueline Caster to speak at a Santa Barbara Foundation's Women in Philanthropy program.